When the White House gains its newest resident this week, one of the many things that will change is the art hanging on the walls. 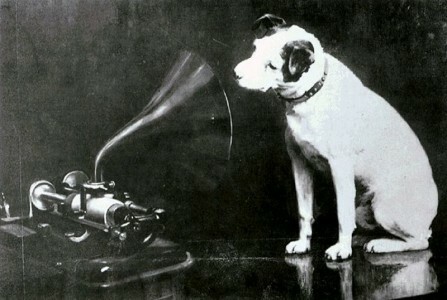 Each new president is able to choose how they furnish and personalise that most famous of offices. The new First Family will inherit the White House’s permanent art collection, comprising around 500 paintings, and will have full authority over what works are put on display. In the past, these have often been portraits of former presidents they admire: Ronald Reagan liked to be looked down on by Calvin Coolidge, George W. Bush by Eisenhower, and Barack Obama by Truman. But over the years the walls have also boasted paintings by Georgia O’Keeffe, Jacob Lawrence, Susan Rothenberg, W. H. D. Koerner and Wassily Kandinsky. As Mr Trump starts to think about what he’s going to be looking at on the walls for the next few years, we’ve dug up things you may not have known about art, the White House and the presidency. The Kennedys placed a lot of emphasis on bringing the arts to the White House, and lending cultural weight to JFK’s presidency. Famously, Jackie Kennedy put enormous effort into an extensive restoration of the White House, bringing in artefacts, antiques and artworks to transform what she felt were bland, uninspiring rooms. She helped to create the first ever guidebook for the White House and shaped it into the historical, as well as functional, building it is today. She gave a tour of the restoration for TV, which you can see here. As her project progressed, Mrs Kennedy realised the need for someone to look after the growing White House collection of arts, and so the position of curator was established. 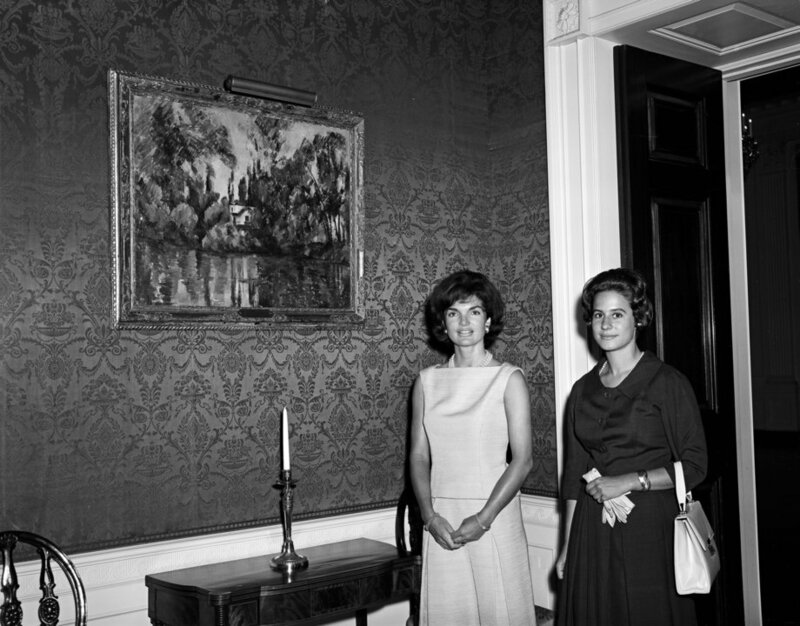 Subsequently, Congress brought in legislation declaring the White House a museum, defining Mrs Kennedy’s work as historic preservation, rather than mere redecoration. The law protected items given by donors so that they couldn’t be kept personally by a president: to this day, items donated either stay in the White House or live on loan at the Smithsonian. The Kennedys entertained leading figures from the arts throughout their time in the White House. 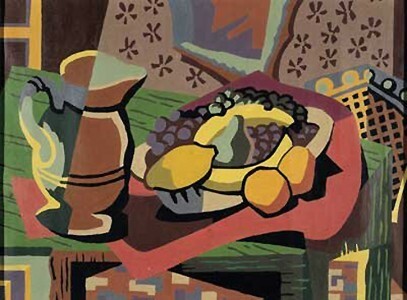 Over one particularly remarkable dinner, attended by the likes of Mark Rothko, Franz Kline, Andrew Wyeth, Saul Bellow and Tennessee Williams, the Kennedys had so entranced the French Minister of Culture that he promised to send to America France’s greatest cultural treasure – the Mona Lisa. His promise was kept: in December 1962, a special loan was made, and Americans got the chance to see the painting in person at the National Gallery of Art and the Metropolitan Museum of Art. Probably the most famous painting in the White House (and pictured here is a different copy, not painted by Gilbert Stuart), this depicts George Washington at 64 years old, sweeping his arm out and renouncing a third term of the presidency – and so securing one of the key tenets of American democracy. 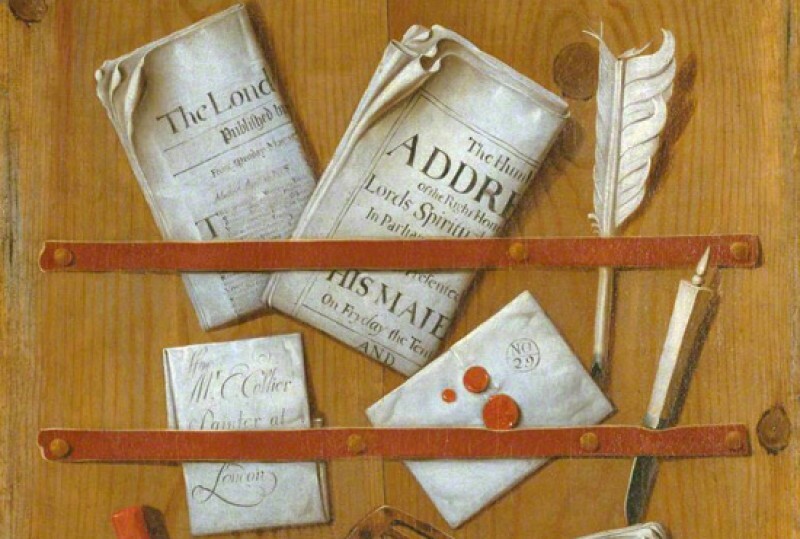 Washington’s sheathed sword in the portrait is intended to remind us of his military past, but his unshowy, civilian clothes symbolise his desire to set up the American presidency as an office without the pomp and pageantry of a monarchy. Famously, then-First Lady Dolley Madison saved the Washington portrait when the White House was burned down by the British in 1814, reportedly having the large canvas ripped from its frame in order to get it out of the building quickly. However, the painting she saved is a copy. The original, known as the ‘Lansdowne Portrait’, was owned at first by the British Prime Minister, the Marquise of Lansdowne, and now hangs in the Smithsonian Museum’s National Portrait Gallery. The painting’s original popularity meant that Gilbert Stuart made several reproductions, and differentiated them through deliberate spelling mistakes. 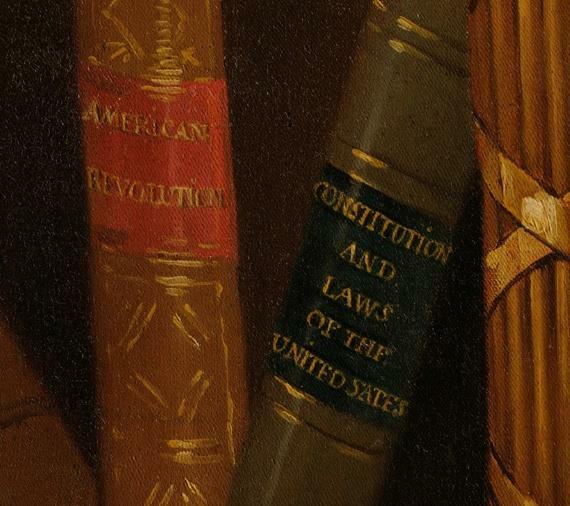 A close inspection of Dolley Madison's saved copy – still hanging in the East Room – shows that one of the books under the table boasts the title ‘Constitution and Laws of the United Sates’. Watts’ painting Hope was the subject of a sermon delivered by Jeremiah Wright in 1990: a sermon that Barack Obama was listening to. Wright said of the painting in his speech: ‘...in spite of being on a ticking time bomb, with her clothes in rags...her harp all but destroyed and with only one string left, she had the audacity to make music and praise God…and that is what the audacity to hope will do for you’. 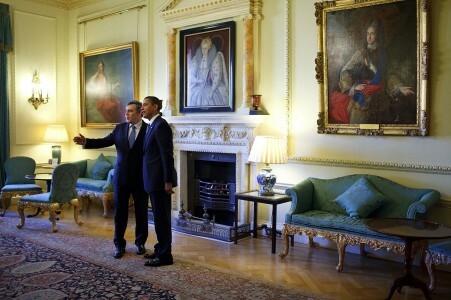 The painting was specially displayed in Buckingham Palace for Barack Obama to view when he visited the UK. Watts was also popular with President Roosevelt: his painting Love and Life was gifted to the American people and installed in the White House on FDR’s orders. The 1940s and 1950s saw the rise of Abstract Expressionism in the USA – throwing off the shackles of the Second World War and giving way to forms of painting never seen before, by the likes of Jackson Pollock, Mark Rothko and Willem de Kooning. According to the journalist and historian Frances Stonor Saunders, the CIA ‘fostered and promoted’ the rise of Abstract Expressionism. Why? ‘...because in the propaganda war with the Soviet Union, this new artistic movement could be held up as proof of the creativity, the intellectual freedom, and the cultural power of the US. Russian art, strapped into the communist ideological straitjacket, could not compete’. It’s true that the CIA funded cultural initiatives as part of its propaganda war against the Soviet Union, via organisations such as the Congress for Cultural Freedom – including, for example, the Boston Symphony Orchestra travelling to Paris to perform. The CCF financed several exhibitions of Abstract Expressionism, but whether or not the CIA intentionally promoted this art in particular remains a contentious issue. However, the rise of this most liberal of art forms certainly helped to show the world just how free you could be in the USA: a key tenet of the US’ Cold War policy, as Presidents attempted to win over hearts and minds with culture as well as asserting dominance with brute strength. Throughout the Obamas’ eight year residency in the White House, Barack and Michelle have gradually replaced some of the traditional landscapes adorning the walls with modern pieces. 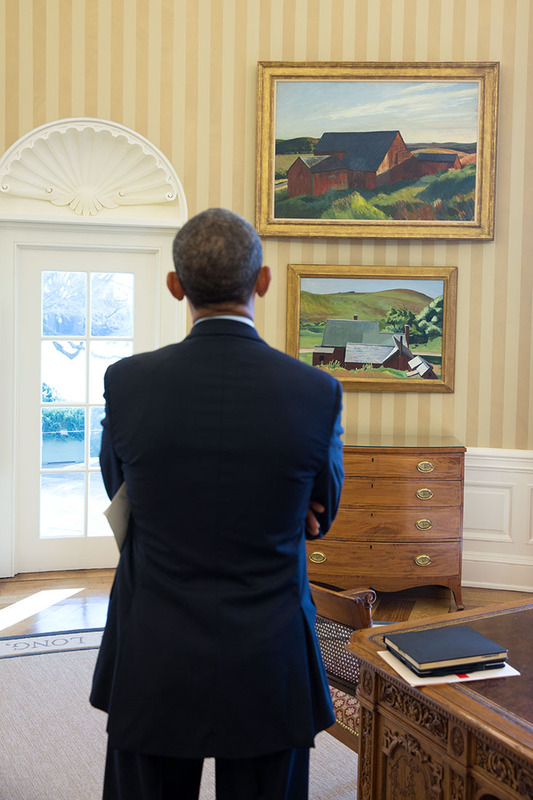 Jasper Johns, Mark Rothko, Robert Rauschenberg, Josef Albers, Richard Diebenkorn: all have had their works chosen and brought to the White House from museums, there to adorn the walls of the Obamas’ public and private rooms (though only paintings over 25 years old are allowed to be displayed in the public section). They’ve shown off their sense of humour with I Think I’ll... by satirist Ed Ruscha, parodying indecision and making a notable break from George W. Bush’s emphasis on decisiveness. Unsurprisingly, the Obamas have also championed diversity on their walls, introducing works by black artists – such as Alma Thomas, William Johnson and Glenn Ligon – and hanging pieces by Native American artists in the Oval Office. Who knows which art Mr Trump will bring to Pennsylvania Avenue. It’s been suggested that he’ll return the bust of Winston Churchill to the Oval Office: perhaps he’d like to include some artworks by the wartime leader himself. Perhaps, to keep some continuity with the Obamas, he could turn to Ruscha, and a reminder of what he now takes responsibility for.